Students from Dapa National High School (DNHS) and Surigao del Norte National High School (SNNHS) emerged as top performers from among the 12 other contestants from the Schools Division of Siargao and Surigao del Norte during the recently held 22nd Provincial Prepared Speech Contest. 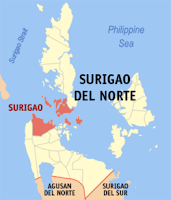 Marilou C. Jabines from DNHS emerged as the top performer in Siargao Division while Jobim M. Sabalo emerged as champion in Surigao del Norte Division. Both received cash and trophy. Other winners for Siargao Division were Cyrine Gladys Podadera from Gen. Luna National High School as second placer and Ramces L. Tiu from Surigao State College of Technology (SSCT) Del Carmen Campus as third prize winner. In Surigao del Norte Division, the second place went to Mylene Orio of Tubod National High School, third place went to Roneliza Ladios from SSCT-Surigao City Campus, fourth place went to Auro C. Apatan from Gigaquit National School of Home Industries and coming in closely as the fifth prize winner was Lindel Edillor from Tagana-an National High School. They all received cash prize and trophy. Other contestants received consolation prizes and gold medals. As a regular annual search for the best high school speaker, the 22nd Provincial Prepared Speech Contest is spearheaded by the Provincial Social Service Office in coordination with the DepEd Schools Division of Siargao and Surigao del Norte, LGUs and the provincial government of Surigao del Norte.